I discovered this technique last year while looking for a garnish for our Cranberry Steamed Pudding photo shoot. This is quite easy, with stunning results. 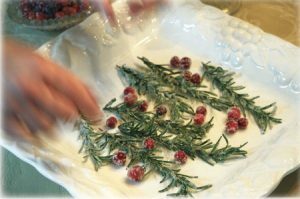 Use as a garnish, delicious snack, or gift. 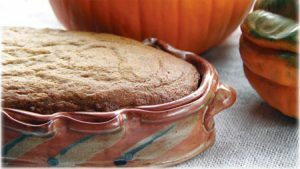 A Wayne Fuerst bowl, available at Local Pottery in Norwell, is the perfect baking vessel for the pumpkin bread. 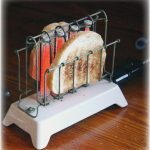 This recipe has been adapted from The Grand Central Baking Book. I always use roasted local sugar pumpkins in place of canned puree; the earthy, intense flavor pairs beautifully with the warmth of the spices and the tanginess of the buttermilk. The best part of this recipe? 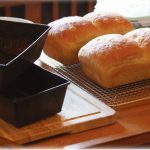 It makes two 9”x5” loaves: one to gift and one to keep for yourself! 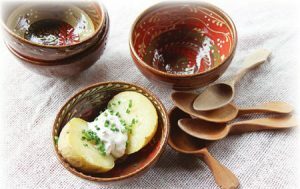 Add hand-crafted bowls from Local Pottery in Norwell, and hand-carved spoons from Peter Follansbee in Kington, to your wish list. 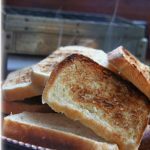 Plato’s Harvest Organic Farm in Middleboro dries and grinds its own garlic into a wonderful, mellow garlic powder. 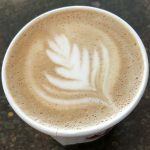 It has none of the harshness and acrid aftertaste of the commercial stuff, no doubt because of the unusual garlic varieties grown there and the lack of additives. This tasty instant garlic makes a thoughtful present for the foodies in your life, and it’s a key ingredient in the following recipes. Other farms make garlic powder too, including Bay End Farm in Buzzards Bay; check with your favorite farmer. This holiday season, don’t be defined by the gift you give—be remembered for it. Vacate the usual and the ordinary with a gift crate filled with a fantastical mix of New England-made specialty foods and housewares from the Town Wharf General Store (TWGS). It’s certain to excite even the most discerning of individuals. 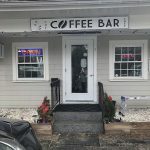 TWGS owners Chris Demakis and Vince Cragin travel the back roads of New England in search of mouth-watering and creative, useful products worthy of their clientele. They’ve curated combinations of these great local products into a selection of more than a dozen custom “gift crates” that they’ll ship across the US, supporting and sharing the notable tastes and work of local artisans. A customer favorite is the “Some Like it Hot” crate that reads like a hot and spicy food junkie’s paradise. Branded with the TWGS logo, the attractive medium-sized wooden crate is filled with premium New England-made BBQ sauces, Vermont Smoke & Cure’s smoked pepperoni, Jump Up & Kiss Me hot sauce, spicy beef jerky, and a copy of Hot Sauce . . . A Field Guide to Making 32 Different Types of Hot Sauces by local author Jennifer Trainer Thompson, among other great offerings. Want to be part of the creative process? Visit the store and have some fun pulling products from their shelves to build your own amazing gift crate! 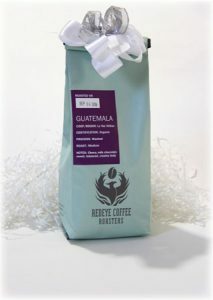 Red Eye Coffee Roasters Guatemala Organic Beans: Fondly referred to as liquid happiness, Red Eye Roasters coffee will brighten anyone’s day. Bags of locally roasted beans are available right at the café. Grinding is available at the counter. 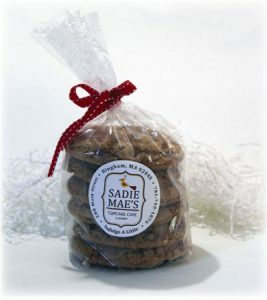 Sadie Mae’s Chocolate Chip Cookies: Packaged in a bag of six, tied with a ribbon, and always available on the café’s counter-top, Sadie Mae’s nut-free cookies are enormous (nearly 5” in diameter) and deliciously addictive. Family-owned and operated in Hyannis since 1992, Pain D’Avignon’s line of packaged pastries consists of the sweet and rich Le Brownie Bite, the popular Bonte et Sante bars, Raspberry Shortbread, and various biscotti flavors, each item is the perfect stocking stuffer. 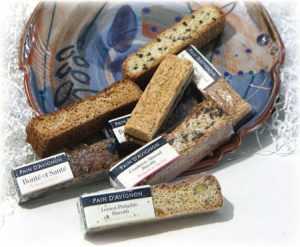 Pain D’Avignon’s biscotti are available at Whole Foods in South Weymouth and Hingham and all of the packaged pastries are available on Pain D’Avignon’s online marketplace. 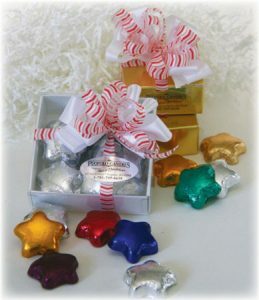 Puopolo Candies: The chocolate enthusiast on your holiday list will savor a box of truffles or a sparkly bag of foil-wrapped stars from Puopolo Candies. Upon entering the store, shoppers experience “chocolate aromatherapy” as the scent of the handcrafted chocolates wafts over them. Divine. 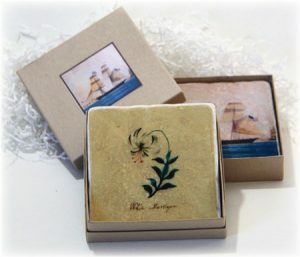 Coasters with a History: Created exclusively for the Duxbury Rural & Historical Society, these charming coasters come gift boxed and include a brief written history. Designs feature images based on 19th century botanical artwork or ships from King Caesar’s sailing fleet. A fabulous idea for client gifts. Gift giving is Elle Maynard’s favorite part of the holiday season. She’s always on the lookout for local artisans that create gifts with a story.